We do offer horse riding tours through world's largest dry forest "Sanutario Historico Bosque de Pomac" National Reserve visiting the Pyramids of Lord of Sican-Batangrande of Lambayeque Culture, the Pyramids of Tucume, the largest arqueological Site of Old Peru and the last Moche Temple Huaca Bandera Tourism on horseback, where you enjoy a wonderful countryside surrounded by nature a place full of vegetation and animals, our farm will be the starting point for the different tours on horse, a diferent way of visiting archeological sites, relaxing and birdwatching. Riding a horse in Peru a way of apreciating the beautiful nature and culture of its land. We are also offering riding vacations where you will stay several days on our farm and will be riding every day visiting all the important archeological sites nearby. 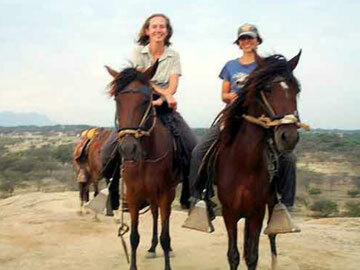 Riding on our typical Peruvian Pasohorses make even inexperienced riders feel comfortable. 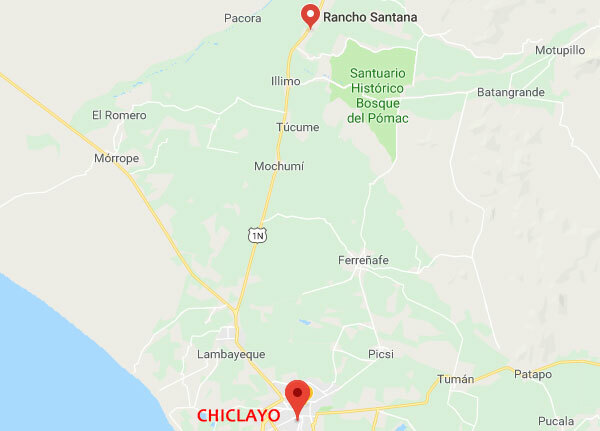 How to get to Rancho Santana? 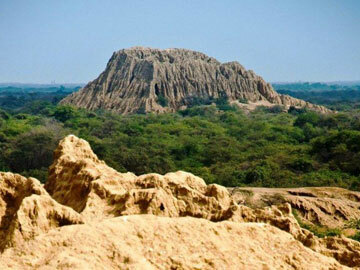 From the center of Chiclayo take a taxi to the PACORA PARADERO. Each taxi driver knows this terminal, not paying more than S/ 5 Soles. From this terminal every 10 minutes a small bus (combi) leaves to the village of Pacora. The combi has a sign on the windshield "Pacora" The ride lasts approximately 1 hour and costs 3 Soles. 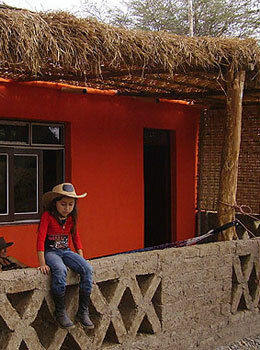 When you are in Pacora, take a mototaxi at the main road to the Rancho (2 Soles). We are approx. 300 meters behind the cathedral. We can send you a privat taxi to pick you up at the hostal, busstation or airport. The cost is 80 Soles. Horses which are willing to please and are well prepared to take you on an equestrian journey of a lifetime. 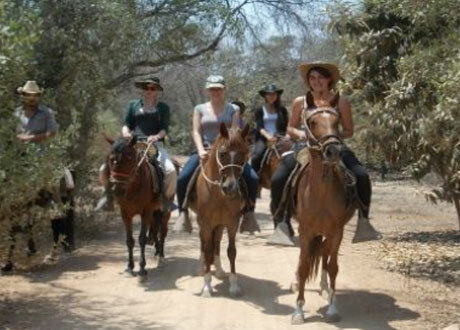 Rancho Santana invites you to discover the magic of the Peruvian Paso horse and the grandeur of its native land. The Sanctuary was created on 01 June 2001 to conserve the cultural and scenic zone made up of the forest of Pómac and the archeological complex of Sicán. 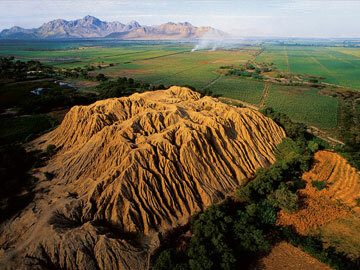 It covers an area of 5,887.38 hectares at an altitude of between 80 and 300 masl. The site contains 36 pyramids from the pre-Inca culture of Sicán, and it was here that the tomb of the Lord of Sican was discovered: a lavish burial with approx 1,2 tons of beautiful artifacts made of gold and other metals. It is now possible to visit the archeological complex where the famous ceremonial knives known as Tumi were found. Pómac forest is a habitat for many species typically found in dry woods, especially birds of many kinds, some of which are endemic. It is an important spot for bird-watchers. There are also different kinds of reptils like iguanas and even the boa constictor lives there. The Sanctuary also contains an ancient tree: an enormous carob with a bizarre shape, over 4 centuries old. Considered the largest and unique in South America which are located around a magical and sacred mountain with 26 buildings over an area of 220 hectares. The 197-foot-long (60-meter-long) sacrificial chamber or passageway at the Huaca Bandera archaeological site belonged to the Moche culture, a pre-Columbian agricultural civilization that flourished on the north coast of Peru from about 100 B.C. to AD 800. The several burials found in the sacrifice chamber "are from a time apparently after the site had been abandoned but nevertheless continued to receive offerings to maintain the status of the elite sanctuary," archaeologist Carlos Wester La Torre, leader of the excavation, said in an email translated from Spanish. 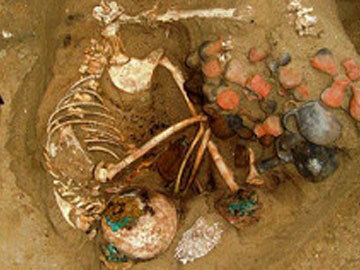 This particular skeleton was found adorned with copper ornaments on her head and ceramics and seashells alongside. Inside the vessels are seeds of the Nectandra plant, a psychoactive often used in ritual ceremonies.